This homemade lemon curd is rich and delicious, and it's really quite easy to make with nothing more than eggs, lemons, sugar, and butter. This lemon curd comes out thick, rich, and full of lemon flavor. Make the curd in the top of a double boiler over simmering water or use a metal bowl which fits into a saucepan without touching the water. We prefer the shape of the bowl for whisking, but the double boiler will work just fine. 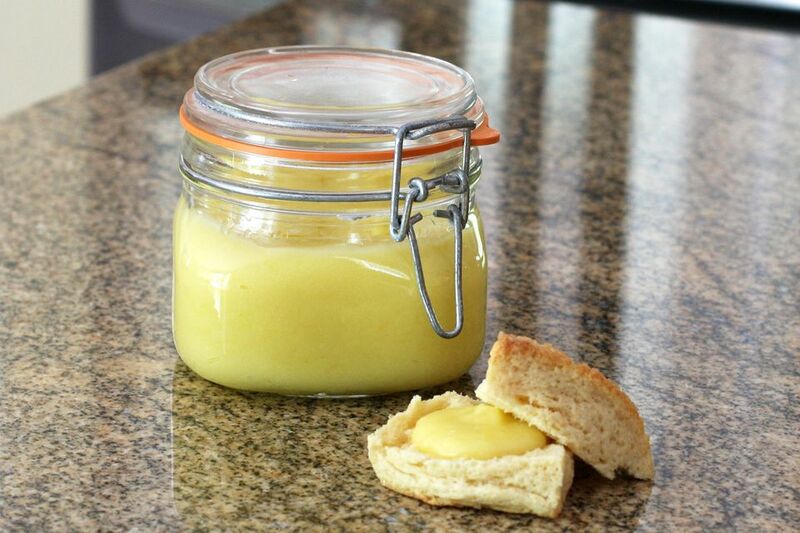 Lemon curd is one of our favorite spreads for biscuits, scones, and muffins, and it makes a wonderful cake or pastry filling. Spread it between cake layers or pipe it into the center of vanilla or lemon cupcakes, muffins, or cream puffs. Have a fine mesh strainer ready over a bowl for when the curd is finished, and have the butter cut in pieces and the lemon zest ready. It's always best to zest a lemon before juicing. In the top of a double boiler or in a metal bowl over simmering water, whisk the eggs with the lemon juice and sugar. Whisk constantly until the mixture is quite thick, similar to yogurt. It should coat the back of a spoon. * This will take about 9 to 11 minutes. Remove and put through the strainer, then whisk the butter into the mixture a few pieces at a time. Add the lemon zest to the mixture, stirring until well blended. Put a piece of plastic wrap over the top of the mixture so it won't form a skin as it cools. The lemon curd will thicken more as it cools. Spoon the cooled lemon curd into a covered container and store in the refrigerator for up to 1 week. To test, dip a spoon into the curd mixture and run your finger lengthwise through the curd on the back of the spoon. If your finger leaves a clean path and the curd on either side doesn't run into it, the mixture is done.